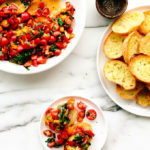 This is truly the best cherry tomato bruschetta recipe, and it's the only one you need. It's ultra simple, super quick, and delicious. In a medium serving bowl, stir together the cherry tomatoes and basil. Drizzle a teaspoon or two of olive oil over top, generously sprinkle with salt, and toss to coat. Taste and season with more salt, if needed. If desired, add a small splash of balsamic vinegar, and toss again. Cover and refrigerate until ready to serve (can be made up to 8 hours in advance). When ready to serve, preheat the broiler on high. Spread the baguette slices out over a large baking tray and use a pastry brush to brush the top of each slice with olive oil. Sprinkle the tops with sea salt. Broil the baguette slices for 2–4 minutes, or until golden brown and crisp on top. Then, carefully rub the top of each with the garlic (it will melt into the surface of the hot toasts). Serve the warm toasts alongside the tomato basil mixture. *If you use one baguette, you'll likely have leftover tomato topping. **The tomato-basil topping can be made up to 8 hours in advance.